I have turned over a new leaf in my food consumption. I have become very consistent at logging every single thing that I eat, big or small, even if it will take me over calories. I used to just skip it if I knew that I was going to be going over. But now beer, appetizers, desserts, a nibble while I am cooking... I track all of it, and I am pretty pleased with myself for doing so! Last night is a good example of that. We went out and I tracked everything that I ate including a few beers. I ended up within my calorie range anyway, but it is kind of hard to see how quickly calories/carbs/fats/whatever add up! But it is helping me to learn to balance my days. If I know that J and I are going to go out to dinner (as I did yesterday) I can plan the rest of my day accordingly! So it was a success, and I hope to keep it up! So maybe a big dinner out + beer = fuel for a Thursday morning track workout? I was nervous about this because that high hamstring/low glute thing bugged me all day yesterday. If it was hurting when I got up to use the restroom, I would plan on running but just another easy pace run instead of hitting the track. When my alarm went off and I got up to use the restroom, I expected to feel a twinge in my glute. Nothing. I swung my right leg around a little... nothing. So to the track it was! The workout that I planned for today was Monday's workout since I slept in then and tempo'd at lunch time. As written it was a 2 mile warm up, 6x400 in 1:54, 1:54 recovery, and a 1.5 mile cooldown. The suggested distance was 5.5 miles. I modified the workout slightly to work best in the dark. So I could just rely on my watch beeps for cues. I did a 2 mile warmup, 6x400 with a 400 recovery, and a 1 mile cooldown. That would bring my total distance to 6 miles. I did not autolap after each 400, so I only have total miles. But here is how the workout turned out for me! You can tell the miles where I was doing the actual workout, can't you? Overall, I am super pleased with this workout, and I am really pumped about the paces that I was able to put up! Tomorrow is a crosstraining day, and I am headed into the gym. 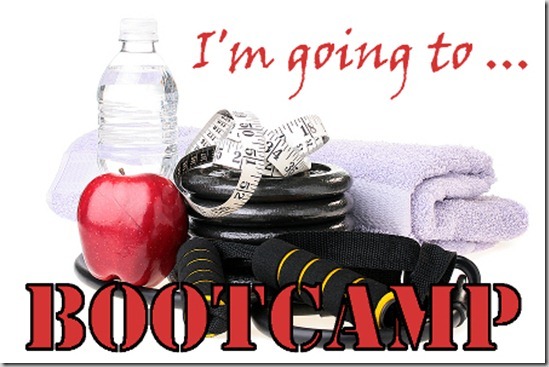 I will be hammering out the final workout C of this session of Best Body Bootcamp. It is tough to believe that it has been 8 weeks already! I am really hoping to revisit some of the workouts again after the marathon. How is everyone else enjoying our final week?